ANYWAY, Back in Spring, Lime Crime were teasing us with some sneaky snaps of the forthcoming additions to their Velvetines range. I was actually really excited about these lipsticks as Lime Crime had not launched a wacky, crazy colour in a while. The four colours being shown off were Teacup - a periwinkle blue; Alien - a black light reactive green; Flamingo - a bright pink; and last, but certainly not least Zenon - a stunning metallic gold. Obviously I had to go and buy them all, didn't I? The shipping direct from Lime Crime was only a couple of days wait as standard and what I love is I've never been custom charged, YAASSS. Zenon was incredibly striking at first glance. Aside from Ofra Cosmetics' Long Lasting Liquid Lipstick in 'Fifth Ave', I don't think I've ever seen a metallic gold liquid lipstick before. It really is something to behold. 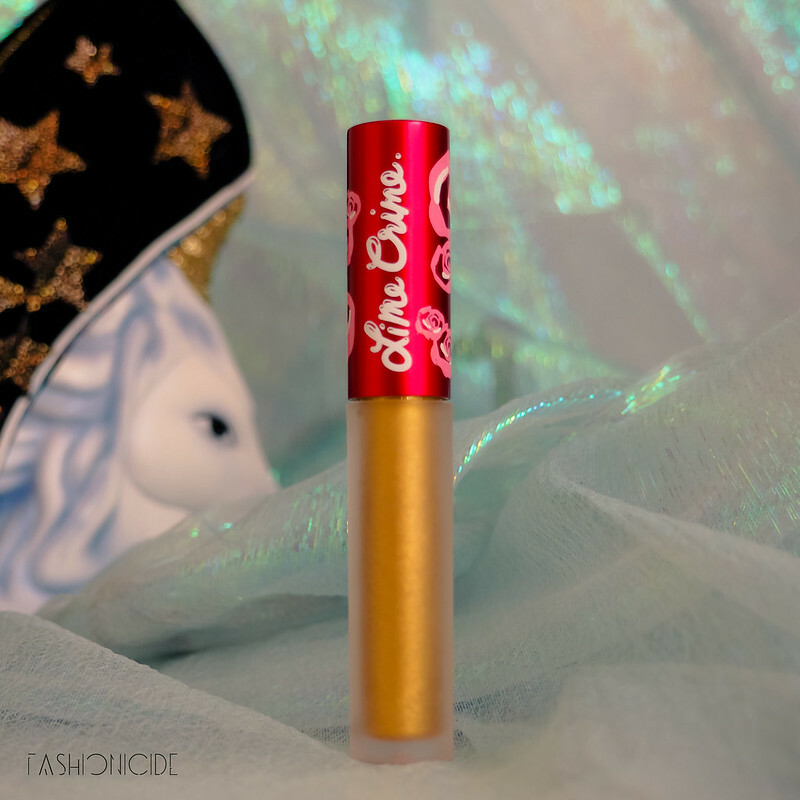 Lime Crime Zenon Velvetines Swatch! In terms of the actual shade, Zenon is spot on. It reminds me of the vast riches of the Ancient Egyptian Pharaohs, it's positively dripping in molten, precious gold. Application is a breeze, the now traditional doe-foot applicator attached to the lid makes it so. The texture is hugely different to any other liquid lipstick, it's much softer and as a result it glides on to the lips effortlessly. 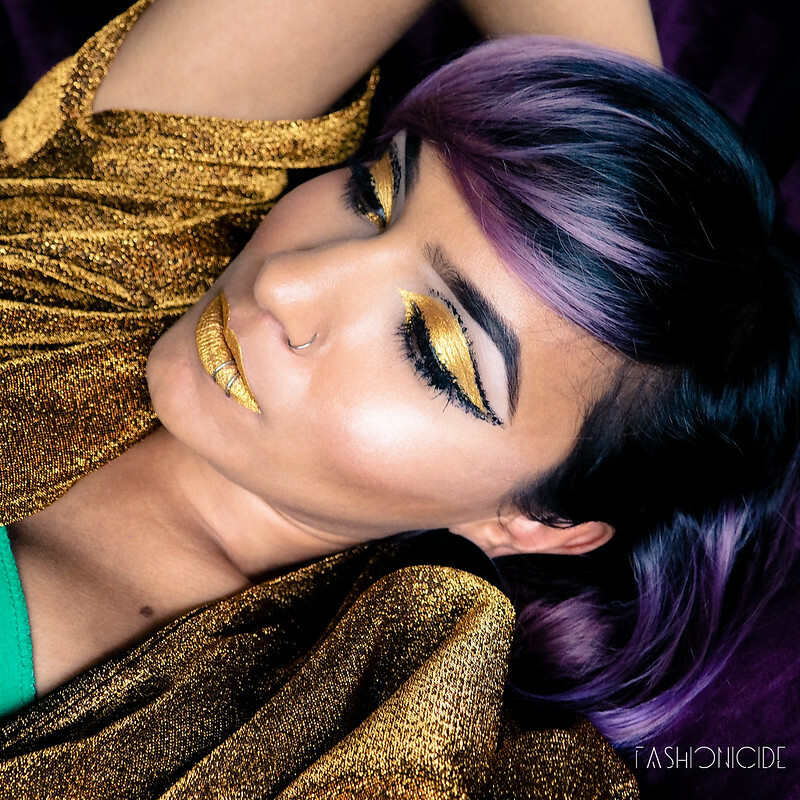 The coverage isn't opaque though, so you'll require two coats to really give your lips that midas touch. It will dry to a matte finish, and I'm honestly amazed by how it maintains that shiny metallic appearance. Also unlike many other liquid lipsticks, it doesn't feel at all drying on the lips, and despite looking like your lips have turned to solid gold, it's quite lightweight. I couldn't just stop at the lips though, could I? I mean, just look at that swatch! So, I went one further and used it as eyeshadow! Again, I applied this with the doe foot applicator switching over to a finer brush when it came to the inner corners. 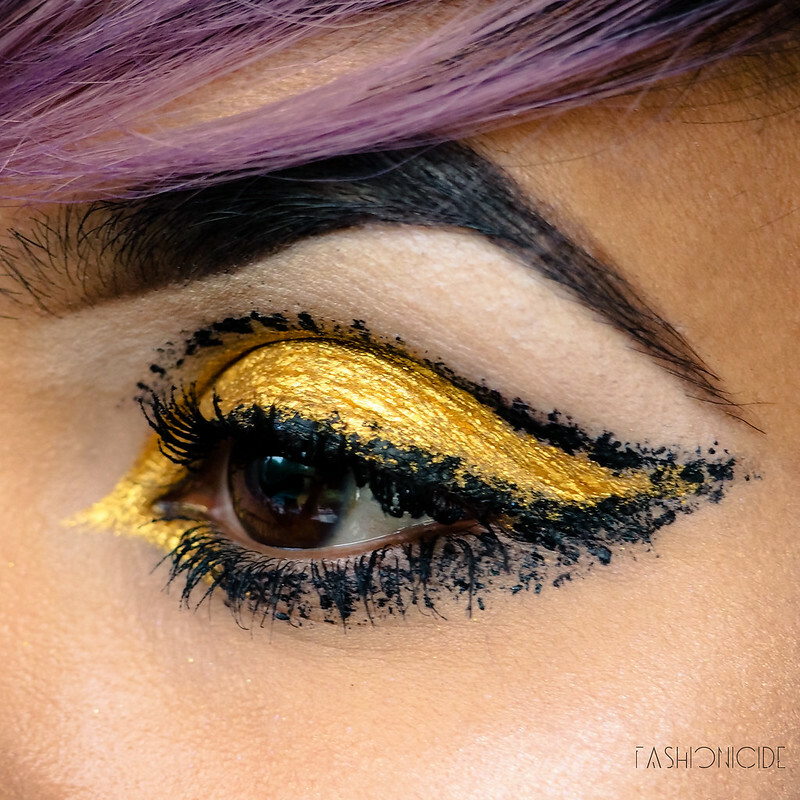 The results are simply magnificent, eyelids dripping in gold. Now I do feel like an Egyptian Queen! So it all sounds great right? Well... Not quite. I have two gripes with this lipstick, and if I'm honest, they're both pretty big. Firstly, it won't last beyond your first drink or cheeky snack of the day. 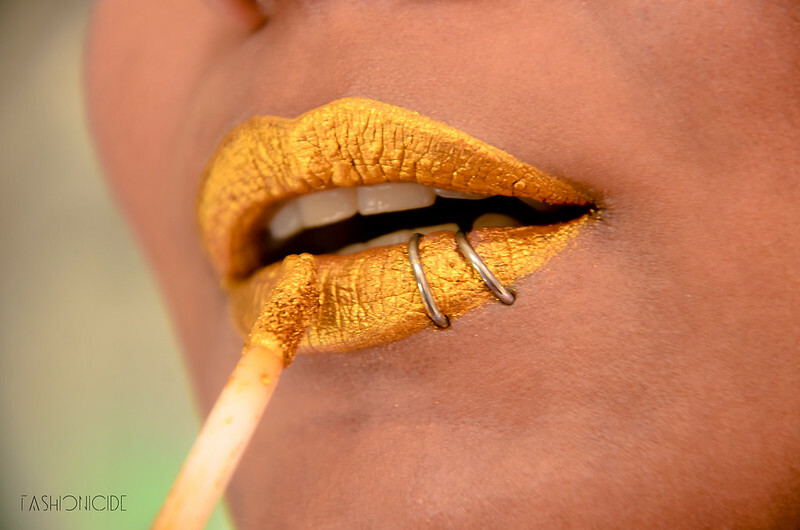 It will fade out almost completely on the inner parts of the lip, leaving a lip-shaped ring of gold as an outline. Sure, it's a liquid lipstick, and I should expect some fading after eating or drinking, but this doesn't just fade. It disappears into an odd looking ombre. And because your eyes don't eat or drink (weird mental image there!) it actually lasts ALL BLOODY DAY as an eyeshadow - no fading, no nothing. My second issue is the amount of product in the tube. I've used this twice on the lips (which needed 4 applications thanks to the layering) and on my eyes as eyeshadow, and now I need to actually scrape out the rest of the product when I want to use it. It's just bizarre how quickly it's ran out. And yes, the tube was full when it arrived! So the question, would I re-purchase? Probably not. 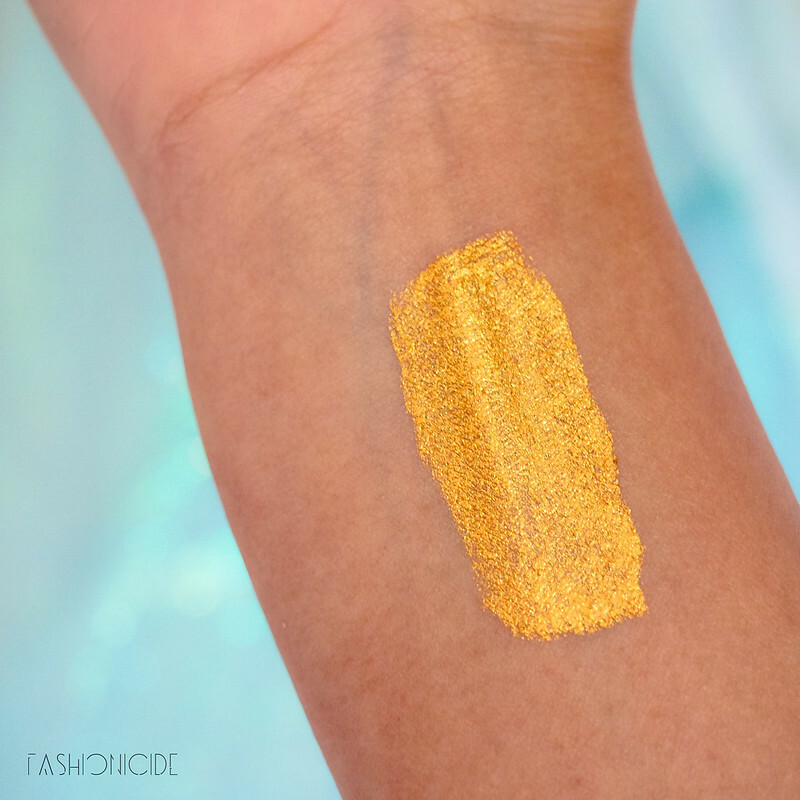 It's easy to get caught up in the oozing, dripping liquid gold stylings of this lipstick, but it doesn't have the substance to live up to the admittedly stunning appearance, which is truly a great shame. This is definitely one for the 'What Could Have Been...' pile. Lime Crime's Zenon Velvetines can be purchased direct from the Lime Crime website in the US for £13.88 (depending on the exchange rate of the day), or £13.95 from Love Makeup in the UK. I sure felt like one - until I busted out the micellar water! Haha. Wow, that some serious pigment!! I am in awe at how you can pull off such vibrant colours well. It's a shame it's not worth the repurchase though! Zenon is such an incredible colour! That pigmentation is amazing. 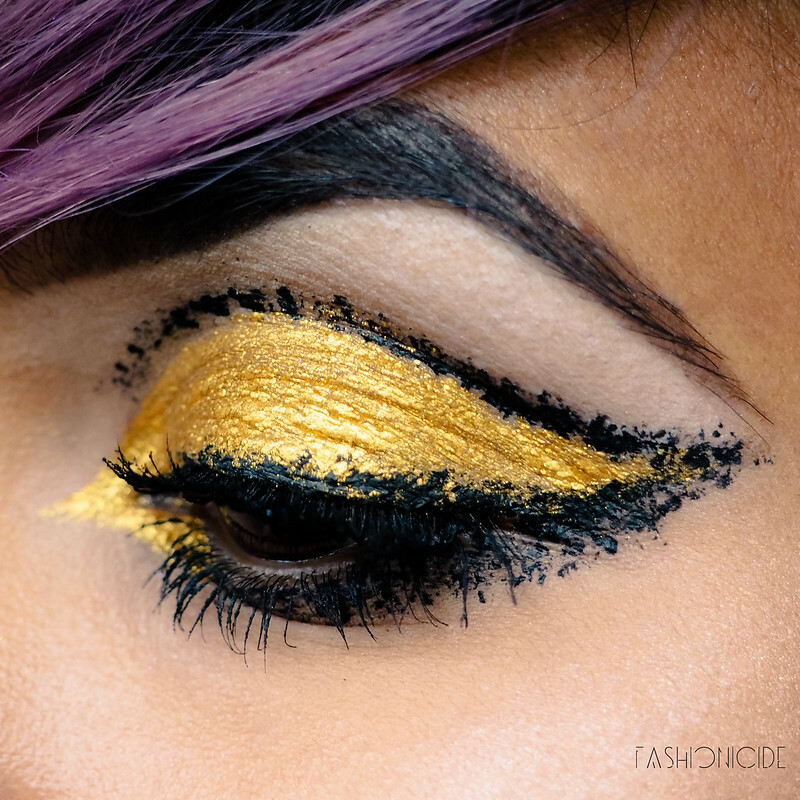 such a cool makeup look!